Prime rib with a kosher salt rub isn't a last-minute dish -- you need at least five to six hours. Done right, prime rib is a fantastic and formidable meal. Getting a perfectly crisped and browned crust over the entire cut without overcooking any of the meat inside is a bit tricky, though. The solution isn't complicated, just somewhat unconventional. Rather than the standard sear-roast-rest sequence, use a roast-rest-sear sequence. It sounds strange, but it works. A kosher salt-based dry rub adds depth of flavor to prime rib, but apply it far enough in advance to prevent dried-out meat; salt the cut too close to cooking, and the moisture drawn out of the meat and seasoned by the salt doesn't get reabsorbed, and simply evaporates during cooking. Take the prime rib out of the refrigerator two hours ahead of time so it doesn't go into the oven chilled. Cold beef doesn't cook evenly. Pour enough kosher salt into a bowl to mostly coat the prime rib. Offset the saltiness with some sugar or brown sugar, but beef dishes do well with a rub heavier on the saltiness than the sweetness. Add coarsely cracked black or white pepper, using the latter for a milder flavor. Incorporate other seasonings to taste, such as cayenne pepper for heat, a liberal amount of paprika or cumin, garlic powder, onion powder, mustard powder, celery seed, coriander, dried thyme, dried rosemary and oregano. Pat the kosher salt dry rub all over the surface of the prime rib. Apply it one to two hours before cooking, while the meat sits out. This prevents drying out the beef and allows time for the rub to impart its flavors. Preheat the oven to 200 degrees Fahrenheit to very gently cook the meat at first. Give the oven about 15 minutes to heat up while the prime rib finishes sitting out. Get out your roasting pan, put the rack in and grease it with nonstick cooking spray. Put the prime rib on the rack of the roasting pan. The bones should point down and the side with all the fat on it should face up. Center it in the oven. 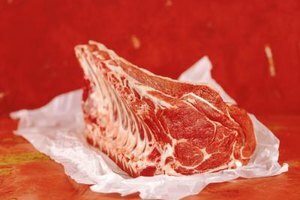 Cook a three- to four-rib joint of beef for about three hours or a six- to seven-rib joint for about four hours. Cooking times are only approximations, though; use a meat thermometer to track the progress. Take the prime rib out of the oven when it hits 135 F at its center and transfer it onto a serving platter. Increase the oven temperature to 500 F for the searing stage and allow it 20 minutes to get there. During this time, let the prime rib rest. It continues cooking and its juices are reabsorbed into the meat's muscle fibers. You won't have to rest it again after searing. Return the prime rib to the roasting pan's rack and put it back into the middle of the oven. Allow just enough time -- typically 10 minutes or a little less -- for the outside of the meat to develop a rich brown coloration and to become crispy. Confirm with your meat thermometer that the internal temperature has climbed to 145 F, as recommended by the U.S. Department of Agriculture. At this point, the prime rib is ready to serve. Many people opt to cook beef to a different temperature than that recommended by the USDA. If you want yours rare, stop roasting at 110 F for a final temperature of 120 F; add 10 degrees for every subsequent level of doneness. Do not let prime rib or other meat sit out at room temperature for any longer than two hours. Store beef between 34 and 40 F or freeze it.